With Halloween only a matter of days away and mid-term break kicking off, it is a really great time for getting the kids busy in the kitchen. While they might go out trick or treating and get bags full of sweets, there is nothing more rewarding than making some simple homemade treats and “scary” food with some simple Halloween themed food. Hopefully you caught my easy cupcakes. At this time of year we are turning them into spooky Halloween delights with a quick change of toppings. I made pink icing for my recent batch but just turn the butter icing into Halloween themed colours by picking blood-red, green, orange or black as the food colouring of choice. Pick up some icing pens in the supermarket. 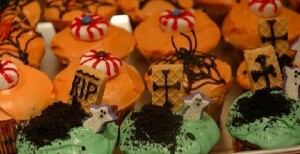 Use red to make dripping blood or black piping to draw out skeletons and ghosts on top of the butter icing. 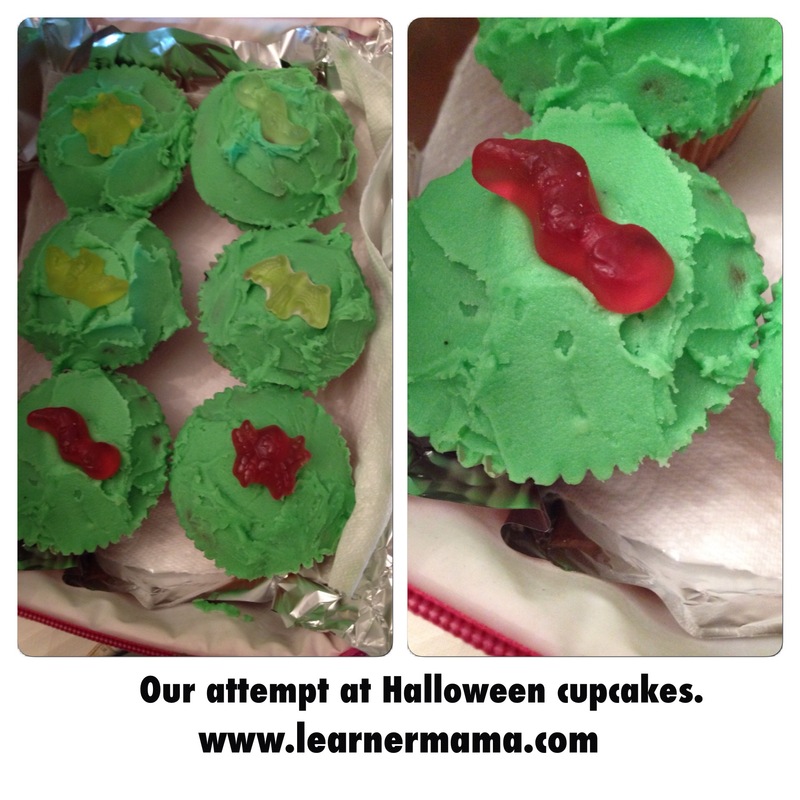 For a little twist add some decorations such as Halloween themed jellies to really bring the cupcakes to life. If you are looking for a really easy life then you can buy a pre made pack of cupcakes or fairy cakes off the shelf and just get straight to the fun bit – icing and decoration. You will also need wooden skewers or lollipop sticks and a bowl of iced water. 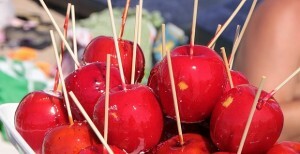 Add the wooden skewers into the apples and then make the toffee mix. To make the toffee bring the water to the boil and then mix in the sugar, butter and vinegar. Adding some blood-red food colouring is an optional extra. Mix until the sugar has dissolved and then boil for about ten minutes then remove from heat. Once the mixture has stopped bubbling, coat the apples in the mixture and dip them into iced water to harden. If you prefer fruit without the sticky toffee, then turning your favourite fruit into a Halloween themed snack is easy by cutting or carving it into a range of Halloween themed shapes – how about a melon peeled and carved into a brain shape with red food colouring running through it, or ghostly bananas are easily done by chopping a banana in half and placing it on a skewers. Sprinkle some coconut and add some chocolate chips or raisins for eyes and mouth. Practically any fruit can be turned freaky with a little imagination. Not everything has to be a sweet treat at Halloween. Turning your kid’s favourite sandwiches into scary Halloween grub is easy with a few simple ingredients and some cutters (or a basic knife). Simple sliced bread with your kid’s favourite fillings can be cut into ghosts or witch shapes. Red jam makes an ideal scary filling which can be oozing out of the sandwich like blood. A mum of three fantastic children who teach me about motherhood every day! Was a full time working mum until I recently took a 1 year career break that turned into 5. Now I blog my way to sanity and am Director of EMZ Digital Media Ltd.
Great ideas – mine are looking for toffee apples so will be printing this recipe! Good luck! An even easier way to do them is to make them chocolate apples – melt chicolate, dip apples (a few sprinkles optional) and allow to dry.